Corporate Ownership: Juncos Central Company, United Porto Rican Sugar Co., Eastern Sugar Associates, Fajardo Sugar Co., C Brewer Porto Rico, Inc.
Hacienda Solitaria was established during the first decade of the 19th Century by José Saldaña Pimentel who operated it as one of five major Ingenios in the Juncos-Gurabo region until his death in 1866. Upon his death, the 324 acre hacienda was operated by the partnership "Hijos de Saldaña" comprised by his 12 children, none which were in the agricultural business. That being the case, the administration was handed to Agustin Dueño Martinez who was married to a grandaughter of Saldaña Pimentel. In 1874 Agustin completed the acquisition of all the sibling's intetrests becoming sole owner of the Hacienda. He operated it until 1894 when he handed over the administration to his nephew Manuel Mendez Dueño who modernized all of its machinery and equipment. Mendez Dueño became sole owner of La Solitaria on April 20, 1904 when he acquired all of its assets from the widow of Agustin Dueño Martinez and his five daughters for $30,000. Prior to becoming sole owner, Manuel Mendez Dueño decided to transform La Solitaria's "trapiche" into a Central Sugar Mill. To accomplish this conversion, on September 10, 1902 he entered into an agreement with Antonio Roig Torrellas to pursue the required financing. In 1904, Roig Torrellas joined forces with Frenchman Julio Gay Del Santo and organized Roig, Gay & Cia. to engage in all aspects of the sugar industry. Inmediately they acquired La Solitaria from Mendez Dueño and 15 adjacent farms totaling 1,496 acres, s a result of these transactions Central Juncos was born. In the summer of 1905 Roig, Gay & Cia. changed its name to The Solitaria Land Company as owner of the land and the Juncos Central Company as owner of the sugar mill. The original stockholders of The Juncos Central Company included foreign bankers Waldemar Hepp, who also had interests in Porto Rico Sugar Co. (Central Pasto Viejo), and Van Alan Harris. During the 1920s notable stockholders included well known business and sugarmen from all throughout Puerto Rico among which were: Spanish immigrant Luis Rubert Catalá , Pedro Giusti, Eduardo Valladares, writer Abelardo de la Haba Trujillo (1865-1923) a Spanish immigrant who was the first president of La Casa De España, Eduardo Gonzalez and Gabriel Soler. Central Juncos enjoyed substantial growth and development between 1904 and 1926 when it was sold to The United Porto Rican Sugar Company. During those years, Roig, under his name and that of The Solitaria Land Company, acquired 105 tracts of land totaling approximately 8,900 acres and accomplished a very good relationship between the Central and its "colonos" of which he was one in addition to being the principal at the sugar mill. His success was due in part to leasing some of his own land to colonos rather than cultivating all of them himself. In 1922 then Central Juncos Administrator Carlos Toro Labarthe (1824-1923), who at one time was the Administrator of Central Manati in the Oriente Province of Cuba and had been appointed by the Governor of PR in 1913 as a member of the Irrigation Commissionm, was appointed Commissioner of Agriculture and Labor. The United Porto Rican Sugar Company was a Maryland Corporation represented by the Moses A. Walker Trust organized in 1926 to acquire five sugar mills in Puerto Rico. 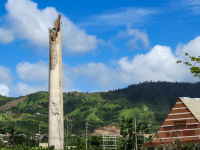 The five sugar mills were: Juncos Central Company, Cayey Sugar Co. , Central Santa Juana, Inc. , Central Pasto Viejo, Inc. and Caguas Sugar Co. (Central Defensa). United Porto Rican Sugar Co. later acquired Central Playa Grande in Vieques for its sugarcane lands but did not operate same. The rest of the incorporators and initial principal shareholders of United are unclear but they included James Howell Post, one of the capitalists behind Central Aguirre and Central Fajardo . L. W. & P. Armstrong & Co. was part of a New York group with interest in the sugar industry through a series of Holding Companies that had controling interests in Central Aguirre , Central Fajardo and the United Porto Rican Sugar Co. Aguirre and Fajardo were intimately related to the National Sugar Refining Co. who refined most of the sugar produced on the island. James Howell Post, who was a Board Member of Aguirre and Fajardo, was President of the National Sugar Refining Company and Board Member of The First National City Bank of NY who in turn was controling interest in Eastern Sugar Associates. In 1933 United Porto Rican Sugar Corporation was reorganized as the result of a Bankruptcy proceeding and awarded to Eastern Sugar Associates whose principal shareholder was The First National City Bank of NY (today Citibank ), its main creditor. Except for Central Defensa which ceased to operate in 1939, Eastern Sugar Associates operated all the sugar mills until 1958 when Eastern merged with the Fajardo Sugar Company . The link between The First National Citi Bank of NY and the sugar industry dates back to 1837 when Moses Taylor , a New York merchant who made a fortune trading sugar from Cuba, joined the Board of Directors of The First National Citi Bank of NY. In the early 1900s, The Board of Directors of The First National Citi Bank of NY included Henry O. Havemeyer of the American Sugar Refining Comany and James Howell Post of the National Sugar Refining Company. Post was also a Board Member of Aguirre and Fajardo . In 1961, all five sugar mills owned by Eastern Sugar Associates were acquired by C. Brewer Puerto Rico, Inc., a subsidiary of C. Brewer & Co. , corporation that owned sugar mills in Hawaii. In 1969 C. Brewer Puerto Rico, Inc. was acquired by the Sugar Corporation of Puerto Rico. Juncos was dismantled in 1975 when its machinery and equipment were sold in Honduras together with that of San Vicente, where they were incorporated to La Grecia sugar mill in the town of Choluteca. In one of the smoke stack pictures, you can see the initials ESA which stand for Eastern Sugar Associates. The yellow structure pictured seems to be what was a sugar mill's office building, it's Art Decco design is similar to the office building of nearby Santa Juana . Today, the grounds where the sugar mill was located are being used by the Sanitation Department of the Juncos Municipal Government.